I’m not gonna say that I saw it coming because that’s simply not true. I did not know Austin Poynter beforehand, never skated with him before and never met him or saw him at a skatepark! The first time I saw Austin, it was the day he landed #1 at the Vans Protec Combi Pool Amateur Contest after flying too high over the coping, better than a Hawk… That day, when I saw the level of those crazy new jacks, I thought I had been hit by a trailer and that I had a lot of catch-up to do. Actually, given Austin’s level, I will never catch-up and I’m even thinking I might stop frolicking in the pools altogether. Aaah, just kiddin’ about stopping skateboarding-what were you thinkin’? One of the reasons that make me feel good, somehow, is that a lot of old school vert dudes will not catch up either, so we are even on this one. 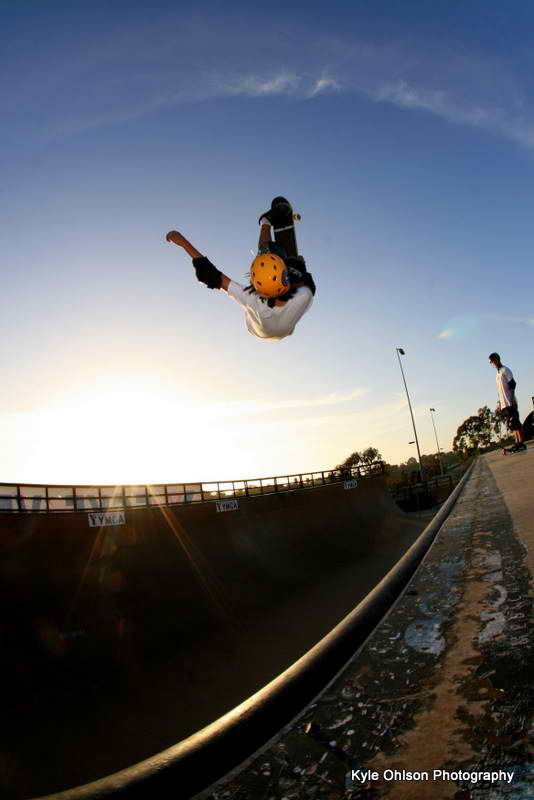 At the same time, while we were complaining whether vert was dead or alive or kicking or resurgent or whatever, Austin was just regularly training, three hours a day at Encinitas’ Y, at the Carmel Valley Bowl or at Clairemont. Definitely smarter than us… The other reason why I don’t feel so bad after all about not previously knowing Austin is that, like his father says, “Austin is a very private person, only a few people at his high school even know he skates, more less him winning a big contest”. He adds that, after his victory at Vans, “he's been a little bombarded (…) and hasn't come down from cloud nine yet..”. And that’s exactly the point: when Austin Poynter won the Vans Protec Amateur Combi Pool Party 10 days ago, he was forced to get out of his anonymity and bombarded into the limelight: “we'll try to get him to come out of his shell for your interview…” confessed his father. Well done, the result is just below. Austin Poynter: Since about 10. Austin Poynter: I was introduced through my friends. We used to do little things around our neighborhood like biking, and scooter, and eventually skateboarding. Skateboarding was the only one that stuck. Austin Poynter: My first set up was a blank deck, Pig trucks, blank wheels, and some Ninja wheels. Austin Poynter: My cousin’s a skateboarder and helped get me started. Austin Poynter: My parents are very supportive; I definitely wouldn’t be where I am now without them. Austin Poynter, master of huge aerials. Photo Austin Poynter private collection. Austin Poynter: The best part about my hometown is the location; we have some of the best vert ramps and pools less than an hour away. There is no downside, I’m minutes away from the beach! Austin Poynter: I definitely like the Pacific Beach area. Austin Poynter: Not much really, school, skate, and homework is basically my daily routine. Austin Poynter: I’ve had a broken wrist and a pretty serious back injury. Austin Poynter: I’m my biggest competitor. Austin Poynter: Adrian Demain, Lester Kasai, Mike McGill, and Christian Hosoi are my favorites. Austin Poynter: I don’t really have one, backside airs are always fun. isTia: What is a Judo Air? Austin Poynter: The first time was sometime last year, a lot of hard work and determination into that thing! Austin Poynter: Definitely the 540. Austin Poynter: I started training soon after Thanksgiving. Austin Poynter: I try and make it to Vans about every few weekends. But for the contest I went about 4 to 5 times a week. isTia: How do you go to Vans so often if you live in Oceanside? Austin Poynter: I would leave right after school and do homework in the car. Vans is exactly an hour from where I live so it’s not too bad. isTia: What’s the best skatepark closest to Oceanside? Austin Poynter: Encinitas YMCA is my favorite, it’s where I go most often, mainly for the vert. isTia: Do you wear pads and helmets in a pool? Austin Poynter: Yeah, I wear my pads most of the time. I feel like I won’t get anything done if I don’t have them on. Austin Poynter, backside twist. Vans skatepark. Photo Austin Poynter private collection. Austin Poynter: I haven’t… I really want to though. Austin Poynter: The first time in a pool was maybe a year after I started skating, it was at Vans in the Combi, I was feeling pretty confident with it. isTia: What are your favorite skateparks? 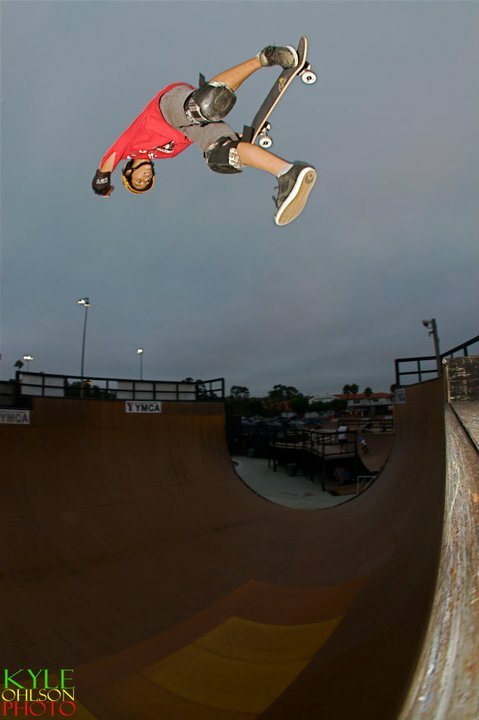 Austin Poynter: My favorites have to be Clairmont YMCA, Encinitas YMCA, and Vans skatepark in Orange. Austin Poynter: I really miss the old Vans skatepark set up, I would give anything to go back to that park for a day. Austin Poynter: The Combi, an X games vert ramp, and a fun little flow course is all that I need. 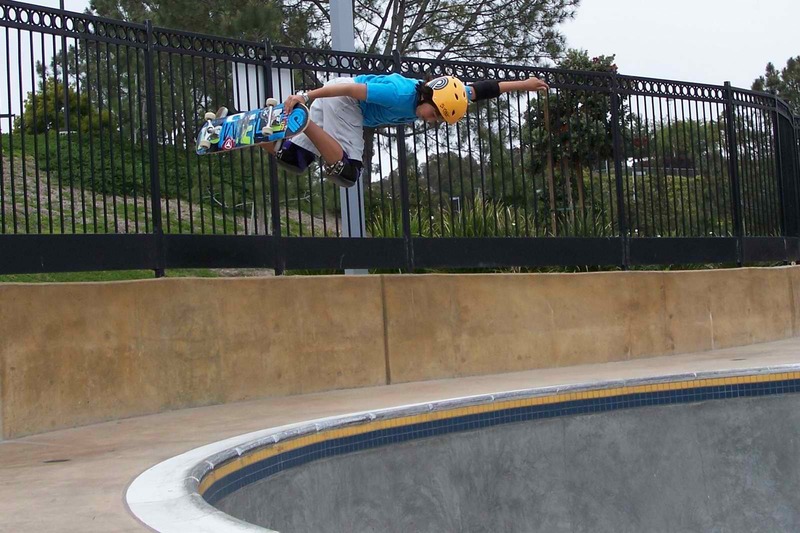 Austin Poynter: I like the fun sessions at Encinitas Y and the fun sessions at Vans. Austin Poynter: I like skating with anyone up for a session! Austin Poynter: It’s amazing to watch Bucky Lasek in the Combi, he kills that thing. Austin Poynter: I skate about 3 hours a day. isTia: How long in vert/bowl/park? Austin Poynter: I probably spend more time in vert then anything. Austin Poynter: I warm up in there, so about 20 minutes or so. Austin Poynter: My first time getting product was one of the most memorable things. Also, winning a trip to Woodward Pennsylvania was a fun experience. Austin Poynter: Going to start doing some contest and traveling, and see how that goes. isTia: "Don't get mad, get even," is the code every skateboarder should live by. Could you comment on that? Austin Poynter: Instead of freaking out, just focus it into the next attempt. isTia: How many Facebook friends did you add after Vans? Austin Poynter: In the past week, 65 and counting, haha. isTia: Shout outs and thanks? Austin Poynter: I want to thank my family, sponsors, and friends for everything.